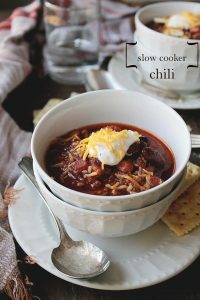 When cooler weather approaches, I immediately start to think about crockpot chili recipes. 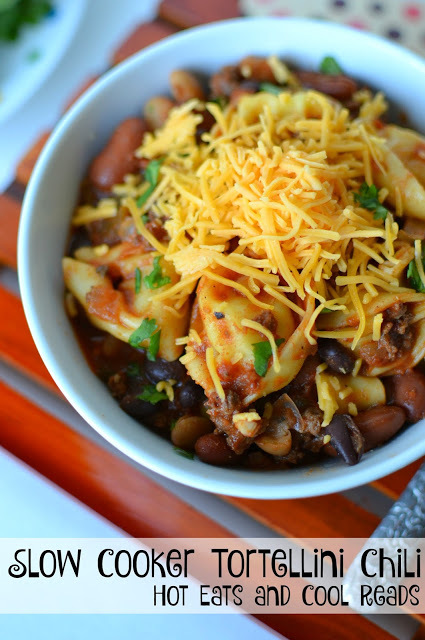 There is something so filling and hearty about a big bowl of chili. Life is so busy and these days the only way I manage to get dinner on the table is because of my slow cooker! I have big ones and little ones and round ones and oval ones 🙂 They are my saving grace these days. I have bought just about all of my crock pots on Amazon and that’s been another time saver. You can find several of the ones I have purchased here. 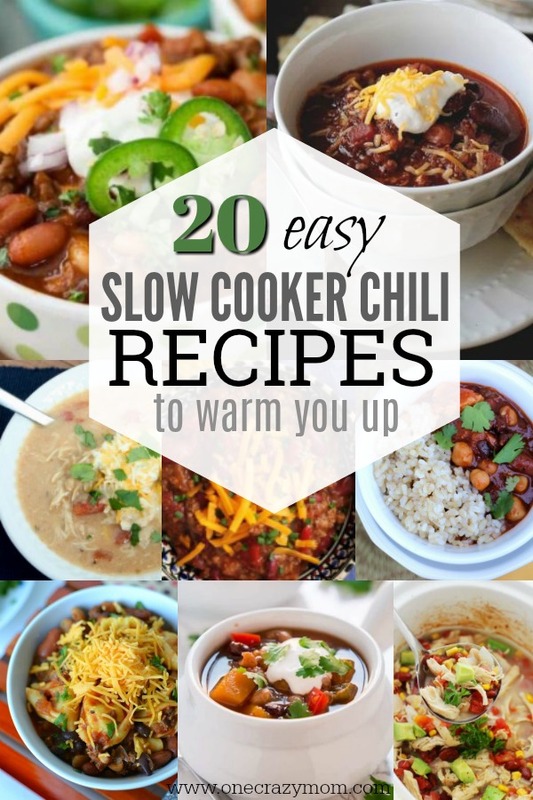 These easy slow cooker chili recipes are a big hit with out family. 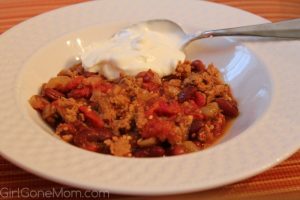 We like this classic recipe for Quick and Easy Crockpot Chili. Top it with cheese, corn chips and maybe a few more onions and it is SO good! Sometimes we need a change though and I fix this Crock Pot Taco Chili. It’s very similar to taco soup. I put out a ton of toppings and everyone just grabs what they want. A few favorites are spring onions, tortilla chips, cheese, hot sauce and sour cream! So good! 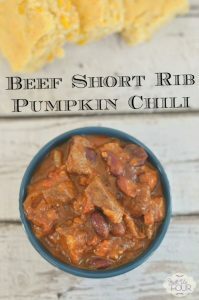 If I make beef brisket and have leftovers, we love Slow Cooker Beef brisket Chili. I love meals that we can eat twice! If you make chili a lot like we do, make a big batch of homemade chili seasoning. It’s really easy to make and cheaper than store bought. 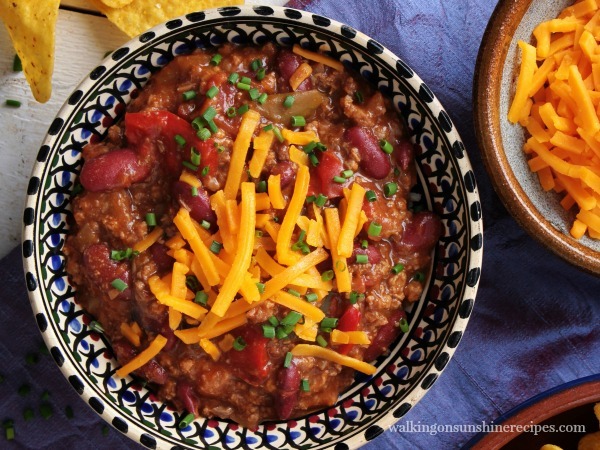 You only need 6 ingredients to make this awesome chili! Such a simple recipe that doesn’t take long to prepare and everyone will love. 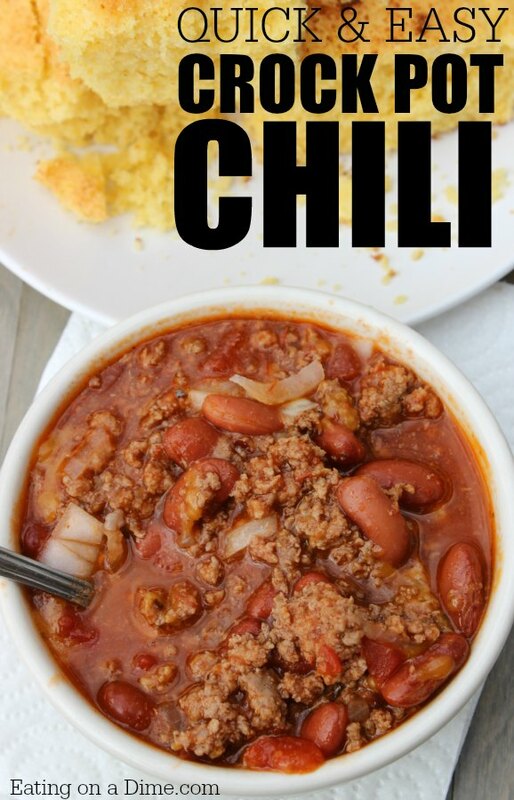 This is a very simple and classic chili recipe. It’s quick and delicious. Dump it all in your slow cooker and have dinner waiting when you get home! This recipe calls for turkey and pumpkin so it’s a really healthy meal that is delicious! 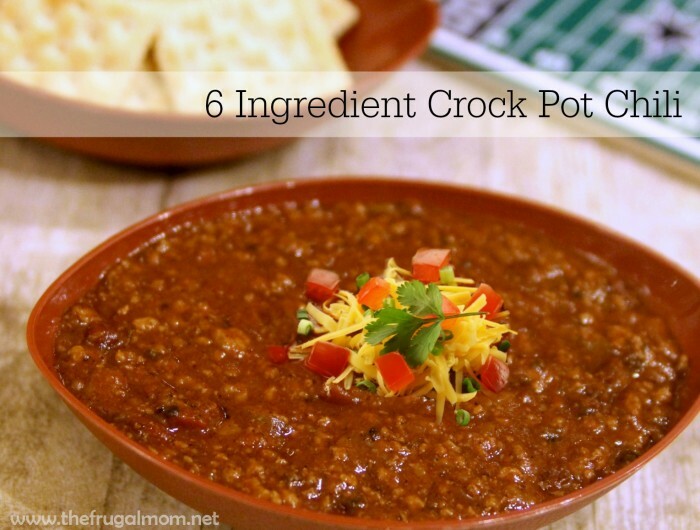 It will satisfy a crowd and cooks so easily in the crock pot! This meatless recipe is perfect for those that don’t eat meat or maybe times when you are trying to stretch your grocery budget. 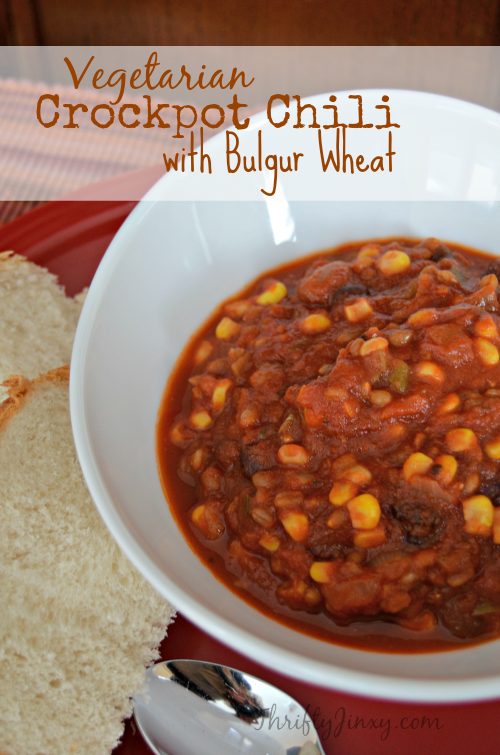 It’s packed with so much flavor and has bulgar wheat to really leave you satisfied. 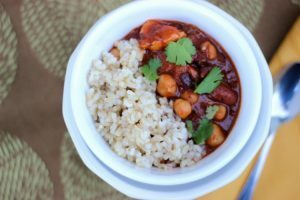 Use chicken instead of beef and white beans for a twist on classic chili. This is so good and a nice change if you are looking for something different. 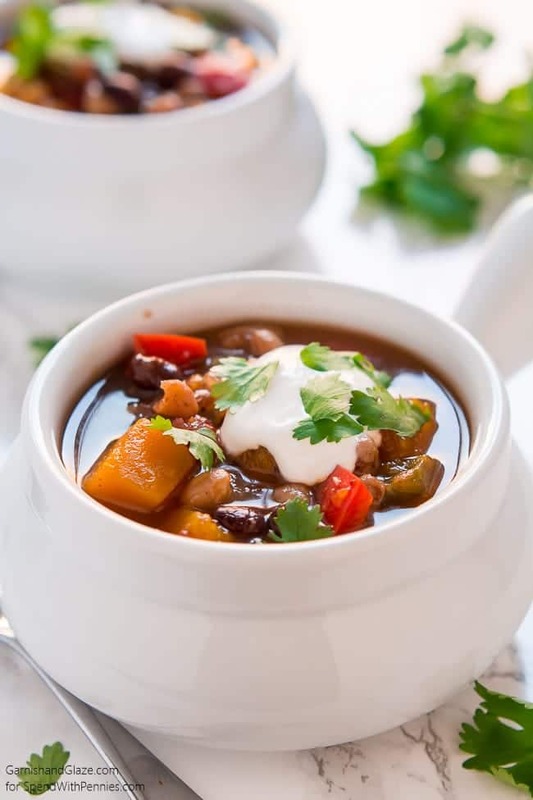 This recipe comes together quickly by using Hurst’s 15 Bean Soup in the dry bean section of the store. Plus, it’s frugal using dry beans. 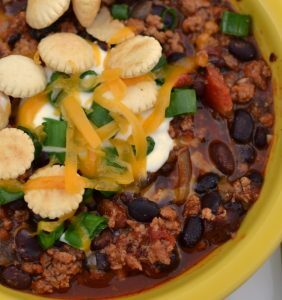 This chili is excellent topped with cornbread, cheese and more! The perfect Fall meal with yummy Fall vegetables! It’s super easy in your slow cooker to make dinnertime a breeze. Cheese tortellini adds something really special to this dish. It’s feeling and delicious! Quick and easy and gluten free! Top with an assortment of cheese, more onion or whatever your family likes. You will love the flavor the salsa adds to this dish. 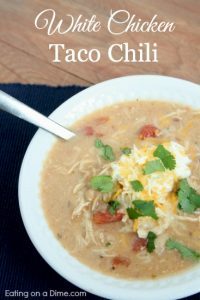 It adds a kick that is so good with the black and pinto beans. We serve with cheese, tortilla chips and sour cream. This is a an easy freezer meal if you have any leftovers. Yummy chili with a secret ingredient- cocoa powder! Top with cheese if you like! This is a great alternative to ground beef and you can omit the chicken if you want this to be vegetarian. This comes together quickly in the slow cooker. It’s a good way to sneak beans into your children’s diet. Since they are the same color as the chicken, they won’t even notice. We top ours with tortilla chips and cheese. Tender beef ribs make this chili so hearty. The pumpkin adds a nice twist even for those that don’t normally eat pumpkin. 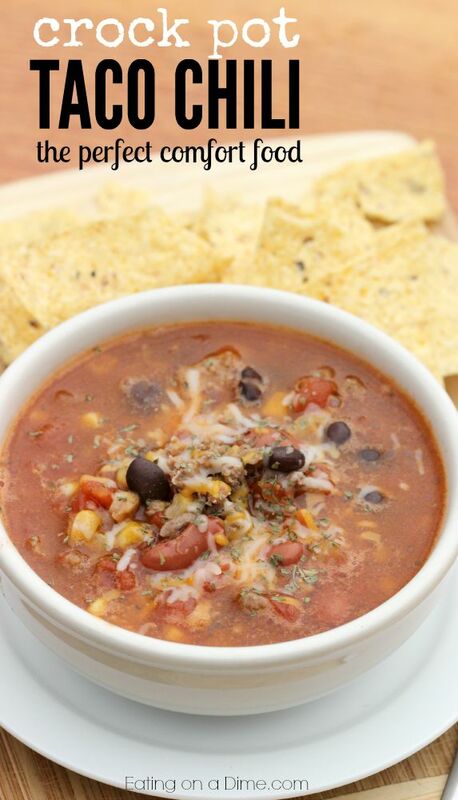 This is made with ground chuck and packed with veggies and beans. Yum! Thick and hearty and oh so yummy! This chili is filling and so easy in the crock pot. 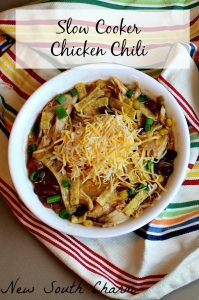 Beans, corn, chicken and more make this chili recipe a hit! This recipe uses ground turkey which is much healthier and more frugal than ground beef. Most people can’t even tell the difference when it’s in dishes like this. This is a great way to use leftover beef brisket. 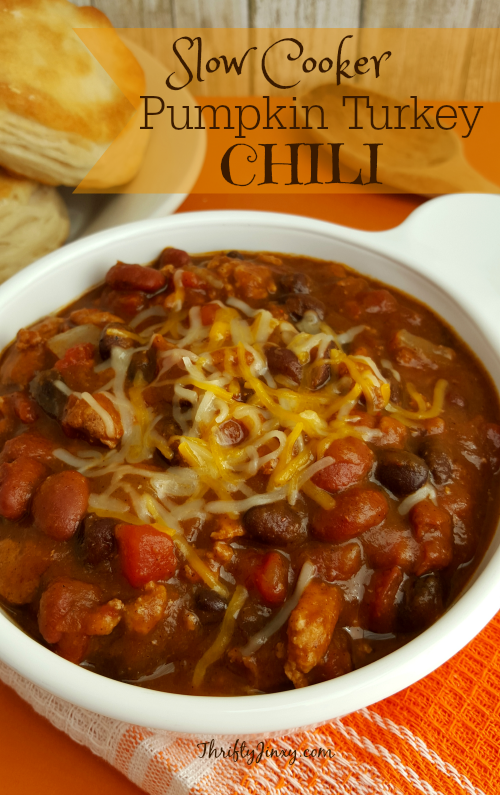 It’s delicious in chili and makes for a nice twist on the classic recipe. 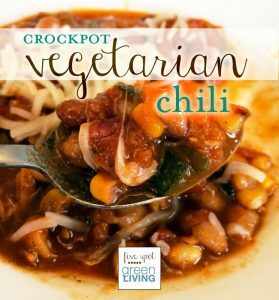 This chili is so hearty and full of yummy veggies, you might not even miss the meat. It’s packed with corn, beans, tomatoes, squash and more. Yum! 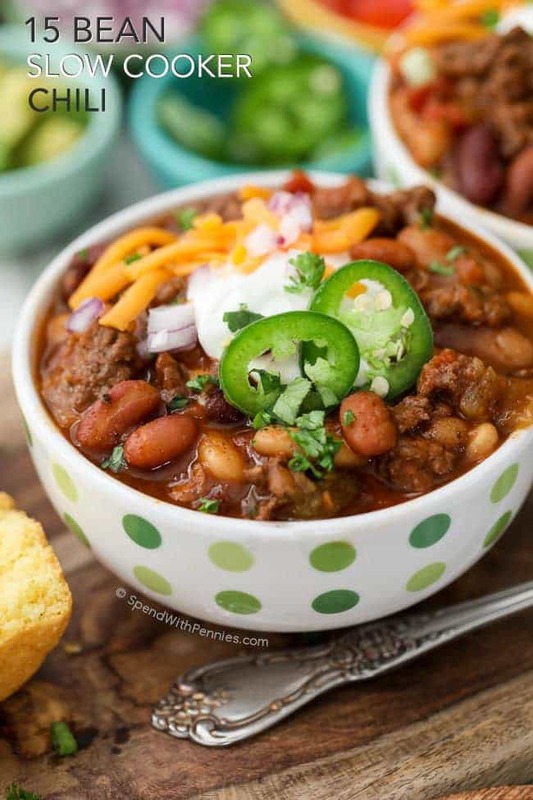 Give these crock pot chili recipes a try! 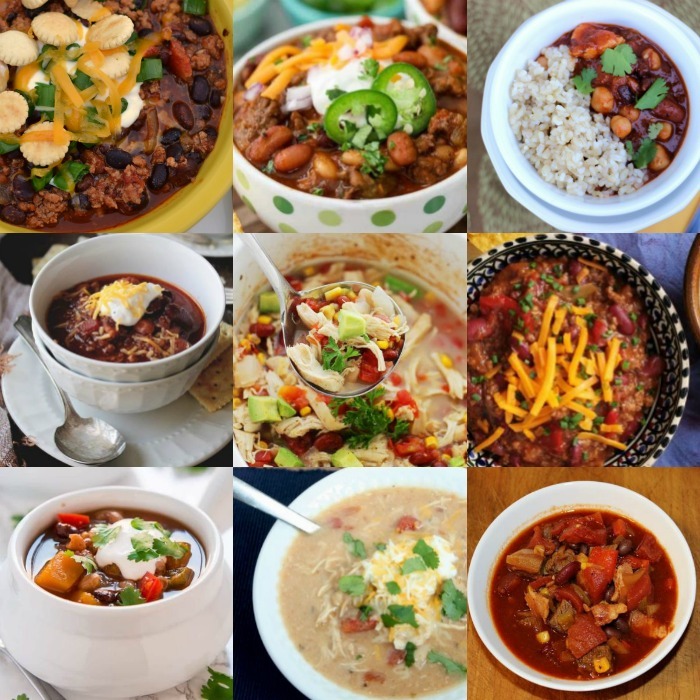 The entire family will love these simple chili recipes in the crock pot. 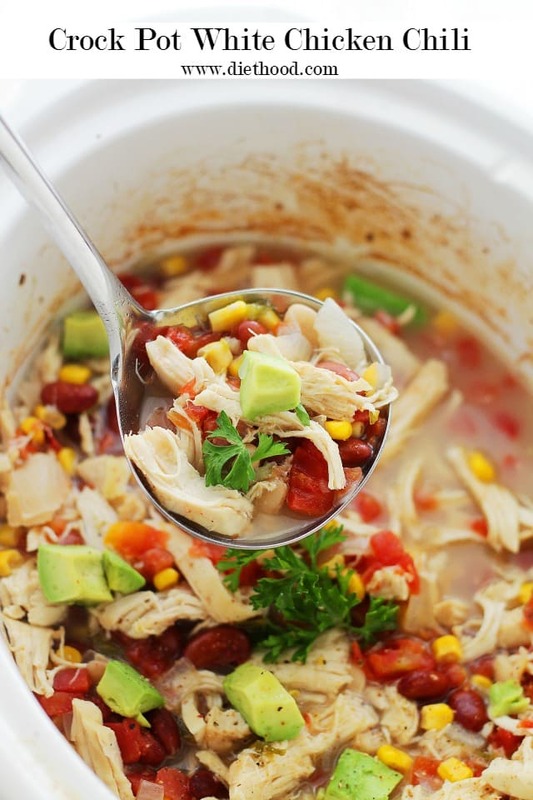 Thanks so much for including my Slow Cooker Chicken Chili! 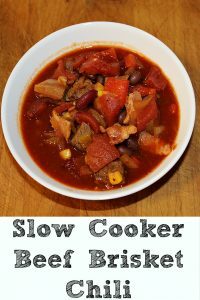 I spotted couple more great slow cooker chilis I must try soon!